Flags, swallowtails, pennants and licence plates have long been shown on vehicles to identify the VIP in the vehicle to friendly service personnel. For the purpose of this article we will call the flags, swallowtails and pennants and their variations “flags,” even though technically only the rectangular type was properly called a flag. Most such flags were used by the military, but they were also used by members of the Royal Family, the Prime Minister, the Governor General, Lieutenant-Governors, members of the Defence Council etc. 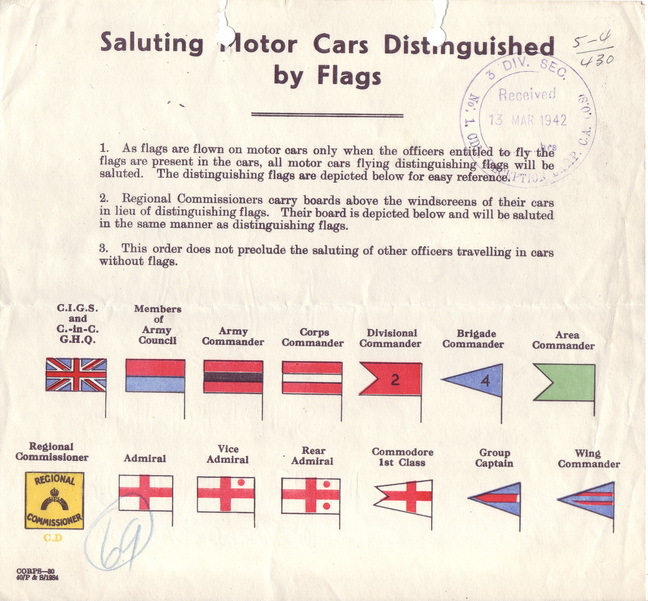 1943 dated circular explaining the British vehicle pennant system. The Canadian Army followed this regime, albeit with slight variations. These flags were/are usually fitted near the front of the vehicle, either in the centre of the hood or on a fender. Field Marshall Alexander’s staff-car in the Canadian War Museum’s collection was fitted with two flag-staffs mounted in a “V” on the front centre of the hood. 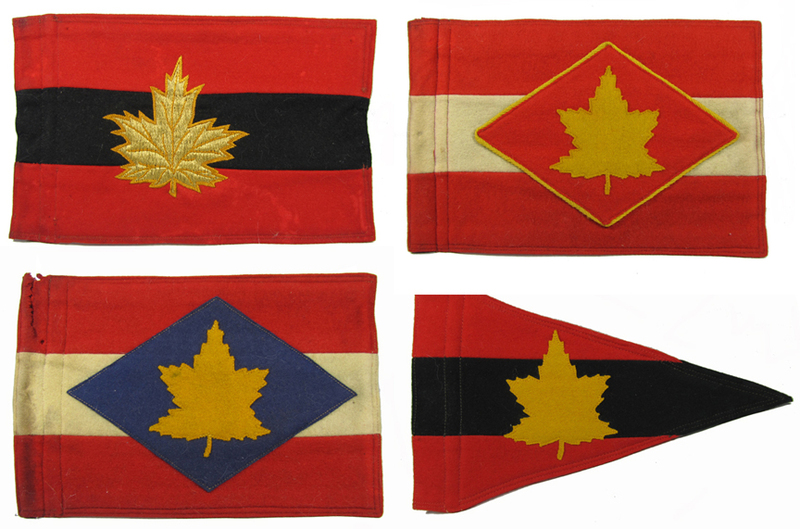 These flags have been called “Distinguishing Flags”, “Vehicle Distinguishing Flags”, “Flag, motorcar, distinguishing” and more recently “General Officers’ Flags and Pennants.” The RCAF called them “Pennants.” The standard RCAF design was a blue rectangular flag on which was a roundel which in turn had a maple leaf in the middle. In addition to this universal pennant there were pennants that identified the rank of the passenger. These consisted of horizontal red stripes denoting the officer’s rank. The Royal Navy, and thus probably the RCN, used flags in the form of a White Ensign with a symbol e.g. a solid red circle in the upper corner nearest the sleeve. 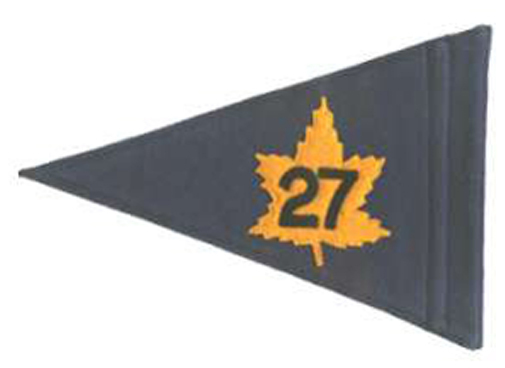 Vehicle pennant of the Commander of an Army, in this case Gen. Crerar GOCinC of the First Canadian Army who is showing it to Field Marshall B.L. Montgomery. 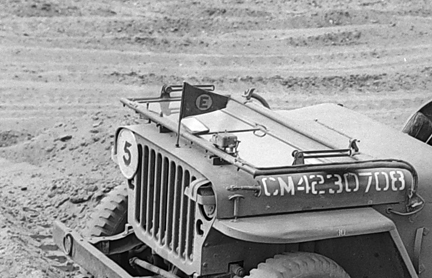 The Canadian Army followed the British system during WWII, but after the war Canada followed Field Marshall Montgomery’s example by both flying a flag and showing a U.S. style Generals’ licence plate with stars on the front and rear of the vehicle. The plates were 6″ high by 12″ wide painted scarlet (later silver bordered red) and had the required number of holes along the centre for the bolting on of “General Officers’ Markings” (i.e. a chromed star or later a maple leaf symbol 2″ x 2″ with the arms 1/2″ wide). A Brigadier/Commander (Naval) would have a licence plate with one hole and thus could affix one star or maple leaf. A Major-General/Rear-Admiral was entitled to 2 symbols; a Lieutenant-General/Vice-Admiral 3; a General/Admiral 4 and a Field Marshall 5. At some point Canada replaced the stars on licence plates with maple leaves. When the vehicle was without the VIP passenger, the driver removed the flag and removed or covered the licence plate. 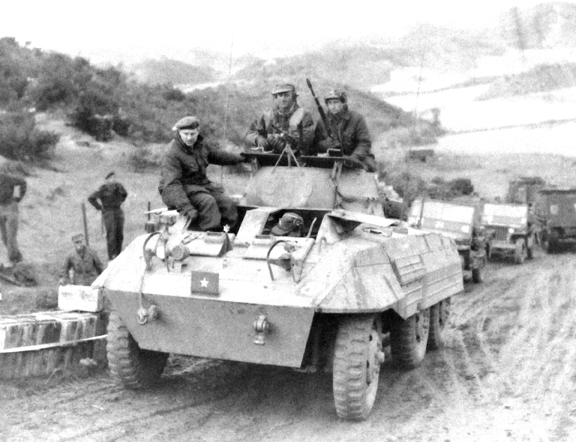 The US pattern general officer rank ‘star’ used by Brigadier Rockingham on his M8 Greyhound, in Korea. Canadian Forces’ “Driver’s Regulations” usually have a section on driving VIPs. Drivers for the VIPs would have access to more than one flag in case of theft, loss, wear and tear or while traveling to other locations. It is believed that supplies of flags would be kept in relevant motor-pools for example. Such flags and their short flag staves were popular souvenirs and a smart driver would never leave them unattended and he or she would also have a spare tucked away. 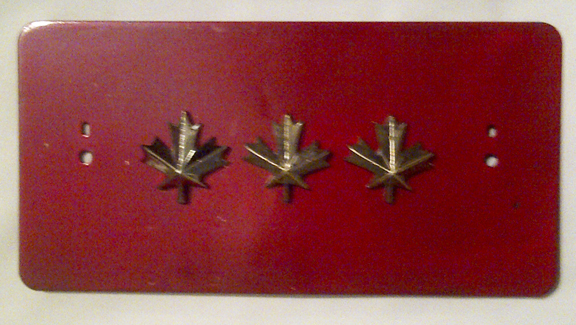 The flag staves were sometimes plain but in peacetime some eventually had a Maple Leaf with a bullet superimposed on top. The basic design was to have a screw-on knob on top which was wider than the sleeve. There was often a collar for the bottom of the flag to rest against, thus keeping it at the correct height above the vehicle. Flag staves had a quick release mounting system, usually with a bayonet mount or spring-loaded ball bearings on the sides and the base remained attached to the vehicle. 1. Rectangular flag for the General Officer Commanding a Corps, Army or Army Group. 2. A swallow-tail for the officer commanding a division. 3. A pennant for an officer commanding a brigade, usually a Brigadier. Top row, Army Commander, First Canadian Army. GOC 1 Canadian Corps. Bottom row, GOC 2 Canadian Corps, Brigade Commander. 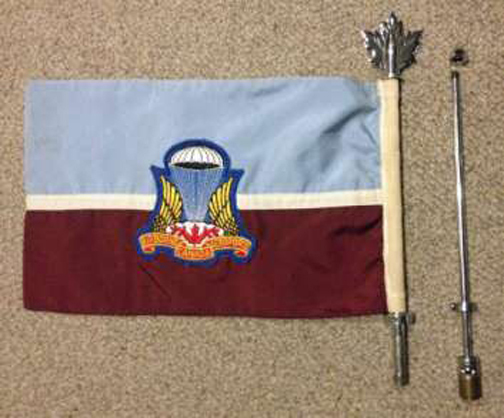 Left, Pennat flown by Brig Kay, GOC 19 Mil Group 1954 to 1958. Right, Authorized vehicle pennant for the GOC, Alaska Highway System. The designs of these “flags” continually evolves. After unification of the Canadian Forces and with a much smaller military than we had in WWII, NDHQ had apparently had more Generals, so other shapes were added. 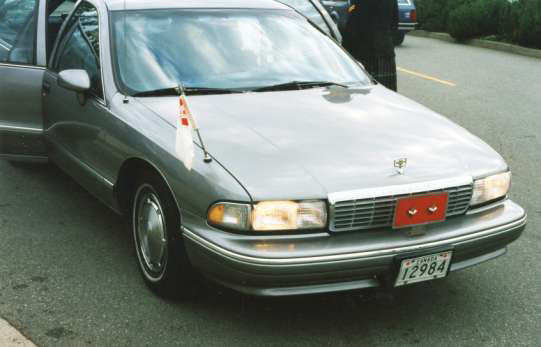 Staff car for Major-General Stu MacDonald with the a swallowtail (borrowed from the author) and a two-maple leaf licence plate. Canadian Forces vehicle licence plate. Issued in red for all General Officers although eligible RCAF and RCN could re-paint the plates in Air Force blue and Navy blue (respectively) at their own expense. From the Canadian Airborne Regiment’s Standing Orders. 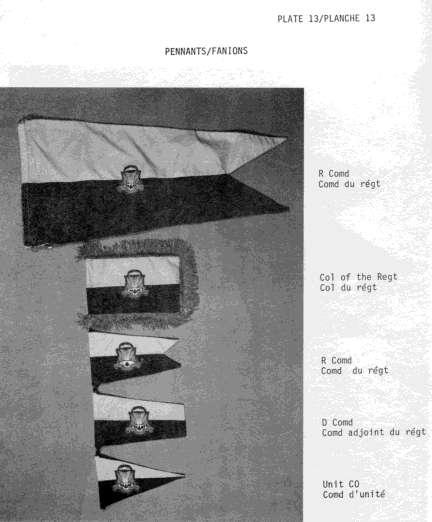 The selection of pennants available to various officers of the Regiment. The 1989 Regimental Standing Orders for the Canadian Airborne Regiment showed even more variations just for their unit. Each flag has a light blue upper half and maroon lower half, with a Canadian Airborne Regimental crest attached in the centre on each side. The WWII flags tended to be made of heavy wool with each colour sewn on separately. They were double sided flags so the construction was repeated on the other side (so that the image was not viewed in reverse) and then the two halves were sewn together. One does find staff car flags made of wool bunting, just like regular flags of the day, but these would not have stood up to much heavy use. The modern Canadian Forces staff-car flags are printed double-sided on white synthetic fabric and have a reinforced sleeve and edges. 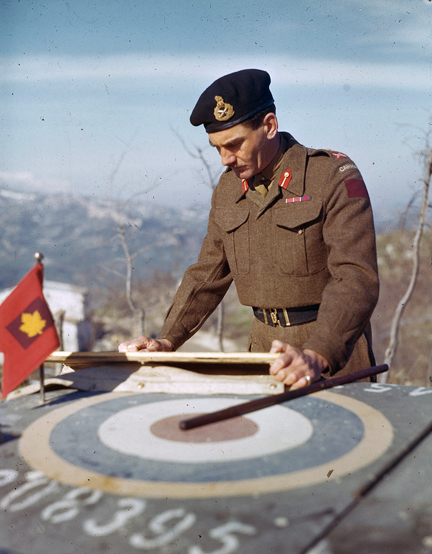 The basic colours and layout used by Canada in WWII were those in use by the British. For example all Divisional Commanders flew a red swallowtail. This was more or less fine for the First Canadian Infantry Division which had a red patch as their symbol, although it did not distinguish them from other British or Commonwealth divisional commanders. It would have been very unpopular with the other Canadian divisional commanders who used blue, French grey, green and maroon as their formation sign colours. Thus we see photos where generals have added their formation patch, sometimes in enlarged form, on each side of their red swallowtail. There was much customization, after all, it is only a higher ranking General who could tell them otherwise. For example the Royal Westminster Regiment Historical Society and Museum has on display Brigadier J. E. Sager’s pennant which has the wording “4 CDN INF BDE”. 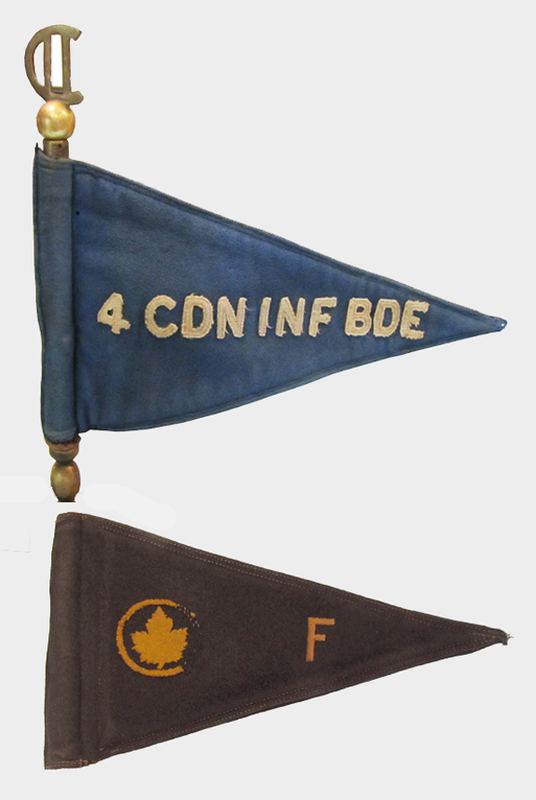 The museum has another of his pennants with a maple leaf in a circle and a letter “F” when he commanded “F” Group. Pennant to the Commanding Officer, “E” Reinforcement Group, in England, ca.1942. One often sees fake staff car flags or other flags incorrectly identified as staff car flags. The key thing to look for is a “sleeve” for the flag staff to fit into. Most staff car flags are also quite heavy-duty as they were designed to take a beating with driving at speed. Most of the fakes have tie-strings or hooks at the top and bottom, but not a sleeve, and many are simply printed on both sides on a single layer of fabric. Size is an important determinant as they will usually fit within a 9″ x 6″ rectangle. The same image design was sometimes used in various sizes for camp flags, flags on board ships and station flags. There are also recognition flags flown by armoured vehicles. I’m responsible for the transition of LFAA to 5th Canadian Division as well as a representative of the RA Park Officer’s Mess in Halifax. Would it be possible for you to send me any additional pictures or actual artifacts that could help establish the history of the Division for the soldiers as well as be displayed within the HQ, formations and units of the division and/or the Mess. Thanks much. Wow, what a great article. Our museum here in Argyle, Manitoba, Canada is home to the country’s 2nd largest museum flag collection – over 1,100 to date, and growing! We don’t have too many military flags yet, but would love to see that component of our exhibit grow. I have another image for this article, Gen Vokes Black Bear, if the author is interested.